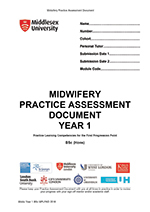 All midwifery students at Middlesex University are now using the pan London midwifery practice assessment document, MPAD. The MPAD was developed by 8 London and is being used for students on both the 3 year BSc (Hons) Midwifery programme and the shortened midwifery course. A guide for mentors has also been developed by all 8 universities. A copy of this is included below as well as a powerpoint presentation which gives further detail about the development of the document and key messages to support the facilitation of learning and assessment in practice.